This Leather Wallet is made from genuine cowhide leather, compact and stylish, it's got space to hold all your things without cramming your pocket full. RFID is the use of radio waves between devices to transfer data. Credit cards, payment cards, and driver's licenses all use RFID. 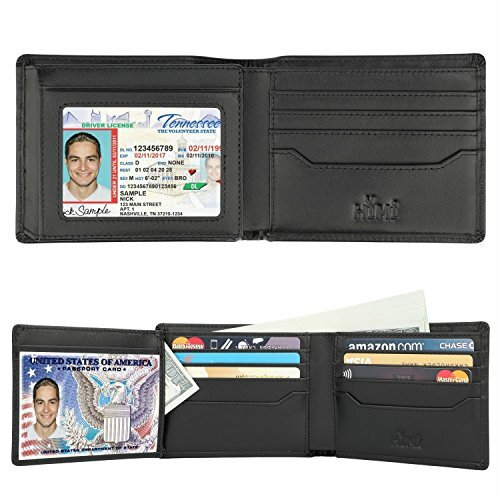 Why need a RFID blocking wallet? Since October 2015, all Credit Cards have RFID chips so you are exposed to data theft. With the new identity theft, a RFID protective wallet is very necessary! Using unique military-grade proprietary blocking material, protect cards from unknown scans with the unique protective layering crafted inside the wallet lining. LARGE CAPACITY: 2 ID windows (DL & Other ID Cards) allow for quick access when traveling or at the store /work place / airport...etc. With 12 card slots & 2 currency pockets, it's easy to carry all your important cards and banknote, meet all your daily needs. COMPACT DESIGN: Our genius designers did all they could, making this trifold wallet slim & compact enough but at the same time very containable, superb for travel, and everyday use, keeping cards safe and organized! It holds up to 20 cards, and 30+ banknote! Wallet size is 4.5" x 3.5''x 0.4" (folded, empty). If you have any questions about this product by HIMI, contact us by completing and submitting the form below. If you are looking for a specif part number, please include it with your message.